Ed has been traveling this week and therefore my “cooking” has been limited to heating up Purdue chicken tenders for the kids and Lean Cuisine spring rolls for myself (thank you, Sue, these have changed my life). I hate to kill the illusion that we always eat wholesome, healthy, gourmet food around here, but it’s time to come clean: We eat our fair share of trash, too. I’d like to think it’s slightly better than the average American’s trash, but who am I kidding? 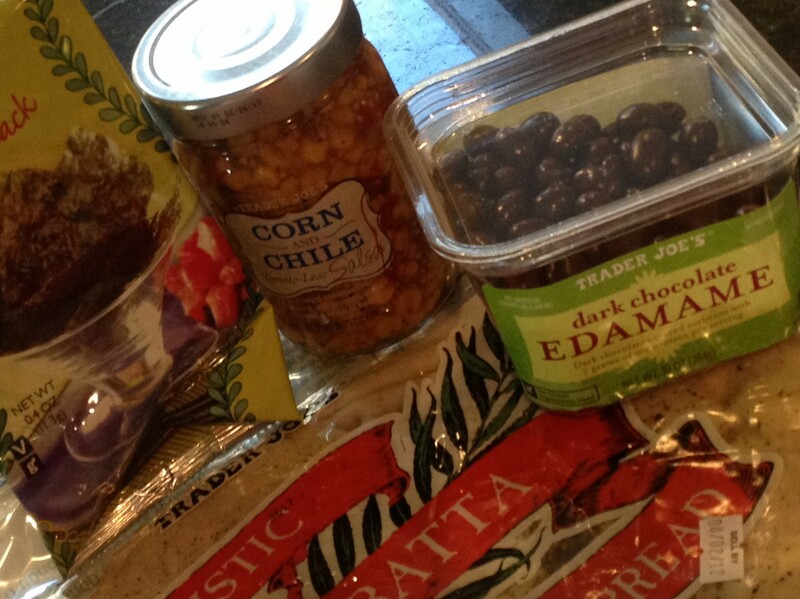 I had a lovely, totally impromptu, midweek trip to Trader Joe’s with my super fun friend. Trader Joe’s is just far enough away and located in a congested enough parking lot for it to feel like a little bit of a trip, a little bit of a chore. I go infrequently enough for it to always feel like a fun treat. As soon as I walked in the door, I was drawn to the flowers. 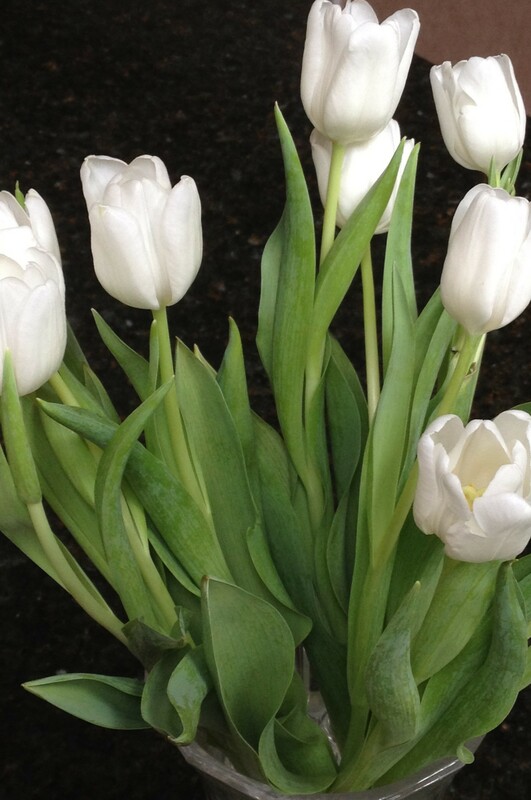 My friend and I agreed tulips are our favorite, and they were hard to resist, so I picked up a bunch of white tulips. As much as I love color, lots and lots of rainbowy color, I always wind up choosing the beautiful simplicity of white flowers. People who like white flowers (and, I would imagine, vanilla ice cream) always have to defend their choice. The world can’t accept that you would willingly choose something so plain when so much razzle dazzle surrounds you. I tend to be attracted to the weirder side of Trader Joe’s. Things like dark chocolate covered edamame appeal to me and my strange children. I primarily hit Trader Joe’s for healthy(ish) snacks and the occasional bunch of white tulips, not for regular grocery shopping. I know lots of people who just shop there solely for their healthy(ish) snacks, so I assumed it was normal. Not so. A couple years ago, we were driving home from Vermont with a car full of four hungry boys. We stopped at a Trader Joe’s somewhere near Milford, Connecticut, and we bought a ton of snacks for the ride home and to stock up for the coming week. The snotty cashier, I’ll call her Judy McJudgerson, scanned each item with disdain while declaring, “Sugar, sugar, sugar, salt, salt, salt, sugar, salt, sugar, salt…” and Ed (mistake number one) tried to explain that we were on a long road trip with four boys and stocking up on snacks for the car and at home. Oh, sweetie. Never explain yourself to the snotty cashier. Have I taught you nothing? Do you think she said, “Oh, NOW I understand! You are weary travelers with hungry boys taking a break and buying a few goodies for the road.” No, of course not. She said, “When I go on a long road trip, I like to slice up orange wedges and bring along little bags of nuts. So much healthier.” Oh, really? Thank you for that lesson in nutrition, Miss Lady Whose Salary I Am Paying With My Junk Purchases. I was so mad and determined to complain to the corporate office of Trader Joe’s, but instead I decided to wait two years, start a blog and tell my story here. No, I’m not that crazy, really. Like every other angry letter to corporate offices and restaurant owners which I cleverly draft in my head, I stewed about it for a few days and then just let it go. But I can’t help myself, it’s impossible for me to go to Trader Joe’s and not remember this story, and maybe wonder what the checkout clerk is thinking of my chocolate covered edamame and falafel chip purchase. With a side of white tulips. This entry was posted in Life and tagged snacks, snotty cashiers, Trader Joe's, white tulips by Mom Mom's Apron. Bookmark the permalink.